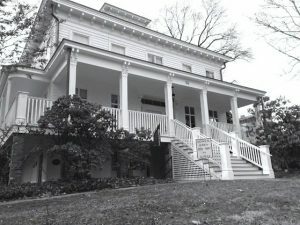 Nyack’s unique character is the result of many special parts of its history: its contributions to our country’s war efforts, its schools, Nyack Hospital, the library, Oak Hill Cemetery, Nyack College, the churches and synagogues, the Thruway/Tappan Zee Bridge/New NY Bridge, Dr. Bernard’s Clarkstown Country Club, Nyack Boat Club, the Tarrytown ferry, the Christian Herald Children’s Home, Camp Ramah, Marydell, the volunteer fire companies, veterans’ organizations, the Fellowship of Reconciliation, the YMCA, Nyack Center, Elmwood Playhouse, the best pizza anywhere and the greatest little independent book shop, to name a few. The written history of Nyack begins in 1675-76 when a 20-year-old Dutchman named Herman Douwese (son of Douwe) came to camp on his father’s land after an Indian deed had been signed and a royal patent had been issued. He was the first known European settler in what is now Rockland County. The natives that Herman found here were the Nyacks, a band of Lenape who had moved here from Coney Island and who had some Taino words in their unique dialect suggesting that some of their ancestors may have come from the Caribbean. Herman’s camp became a permanent home and he was followed here by his parents and brother. Their family name was Talama and Herman anglicized his name to Harmanus Tallman. The Tallmans were joined by other Dutch families. They farmed the land in Nyack for 125 years with little change except that farms were divided among each new generation and additional land was settled to the west. 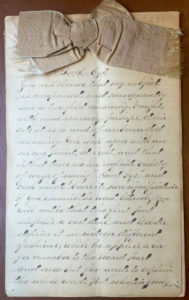 Dutch customs and the Dutch language persisted well into the 19th century. Many farmers owned a sloop to transport their produce to markets in New York. 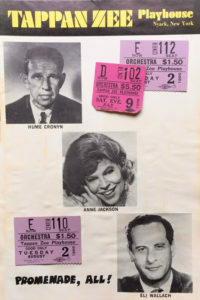 “Promenade All” playbill from the Tappan Zee Playhouse. Farmers along the shore found that the outcroppings of red sandstone provided them with an additional “cash crop” for which there was a ready demand in the city. The quarry business thrived and between 1810 and 1840 there were 31 quarries between Grand View and Upper Nyack, employing about 200 men. Hudson River sloops were improved and enlarged similar to the modern replica “Clearwater”, and served as the main link with the outside world, carrying passengers, produce, freight and stone. Stimulated by the demand to carry stone and Haverstraw brick, Nyack developed many boatyards and became by far the largest producer of sloops along the Hudson. The quarrying and shipbuilding industries created a need for housing and a full range of goods and services, so farmland was subdivided and downtown Nyack grew exponentially, from 7 houses in 1814 to more than 2000 people in 1860. Smaller neighborhoods developed around boatyards in Upper Nyack and South Nyack. 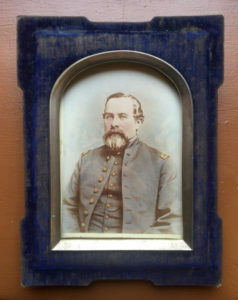 Defendorf served as Captain of Company K of the 135th New York State Volunteer Regiment in the Civil War. John Green, Theunis Smith and Peter Smith were successful businessmen with an eye to the future of Nyack. Each had a general store and John Green had a lumber yard next to his wharf at the foot of Main Street and two sloops with which he sold lumber and stone from Albany to New York City. Together they formed the Nyack Steamboat Association and built the steamboat Orange which began running in 1829 to provide faster and more reliable service than the traditional sloops. With Jeremiah Pierson of Ramapo, they spearheaded the long and ultimately successful campaign to build the Nyack Turnpike to bring the county’s produce and manufactured goods to Nyack’s docks. These two developments revolutionized Nyack and made it the business and retail center of Rockland County for a hundred years. From 1840 to 1890, shoe manufacturing blossomed in Nyack. About six different companies built large factories, mostly 2- and 3-story brick buildings, each producing 1000 or even 2000 pairs of shoes per week and employing hundreds of people. The railroad came to Nyack in 1870, providing greater speed and capacity for passengers and freight, and taking some of the business away from the steamboats. Commuters and shoppers could get from Nyack to downtown Manhattan in a little over one hour by train and ferry. With improvements in both river and land transportation, Nyack developed a significant hotel business. Several hotels lined Main and Burd Streets, a large hotel was built in South Nyack, and Prospect House was a huge palatial structure on Highland Avenue overlooking the whole community until it burned in a spectacular fire. 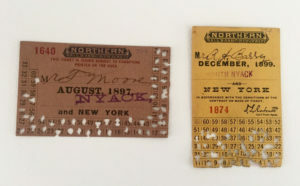 Multi-ride tickets from the Northern Railroad of New Jersey, 1897 and 1899. Manufacturing in Nyack was hit hard by a series of depressions in the 1890s, and retail business by the Great Depression beginning in 1929 and by the construction of shopping malls after about 1960. The business district has reinvented itself periodically to meet changing conditions as supermarkets have come and gone; antiques made Nyack a destination for a while and still maintain a steady presence; restaurants and bars with entertainment are currently popular. Nyack has always been a desirable place to live, driving a relatively prosperous real estate business. Nyack remains a center for the dining, the arts, and business. A vibrant waterfront village, Nyack looks to the future while remembering its storied past. Here you’ll find some helpful links for discovering the rich history of the Nyacks, Rockland County, and the Hudson Valley.